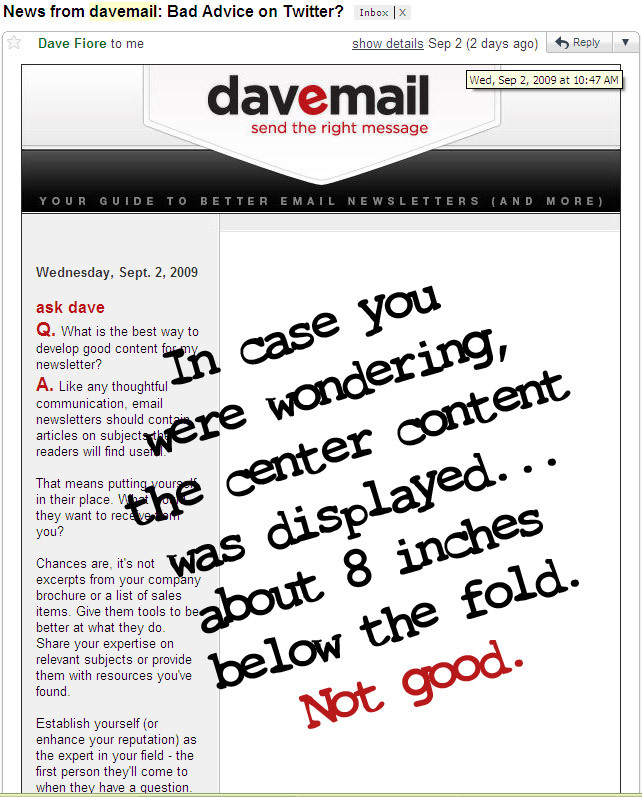 Davemail: The Email Newsletter Experts? I recently received a newsletter from Davemail, a company that provides managed email marketing services, from design to copy writing to delivery. The content was snappy, fresh and on point and brand. The subject line reminded me of who the sender was and what the the content centered around. Good stuff. Dave even remind me to follow him on Twitter, a far better alternative than the traditional Forward to a Friend functionality. 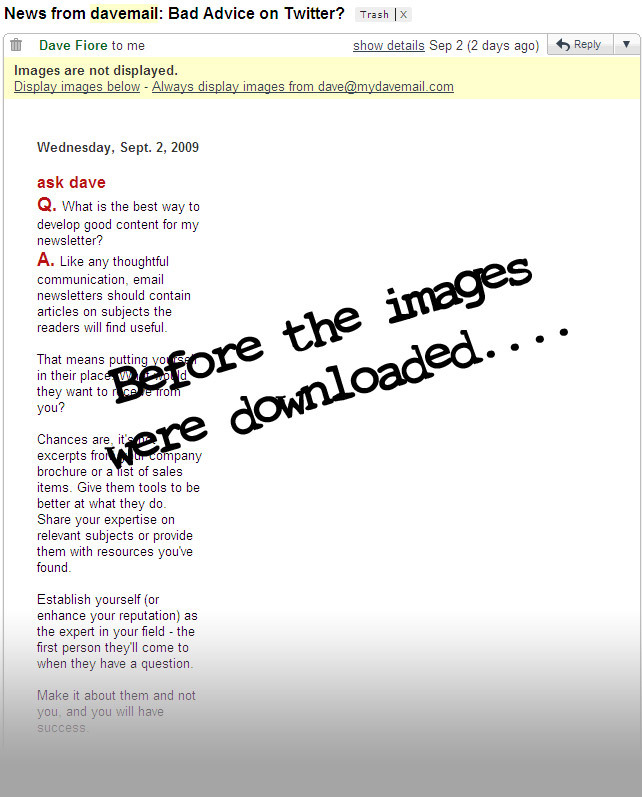 Davemail has major issues in Gmail. If davemail were not the experts I would give them a grade of B- but considering their value proposition and service offerings I must give them a solid D.
In their defense, the message rendered pretty well in Outlook and AOL, but you can’t forget Gmail and it’s growing market share. This is Dave from davemail. I just saw your review of the newsletter you received and appreciate the fair assessment of what we provide. We indeed struggle with coding the newsletters in a way that renders them correctly in Gmail. We have good success with just about every other email client, but have a really hard time with the Google-based email system. The newsletters I see that look good in Gmail are generally a single image that includes the copy – not a real newsletter. If you or any of your readers have any advice for my designers/coders on how to create newsletters that will stand up to gmail, I would love to hear it. We are always working to improve our product – and getting good results in Gmail would be a great thing. Thanks again for taking a look at davemail. Thanks for responding Dave, much appreciated! 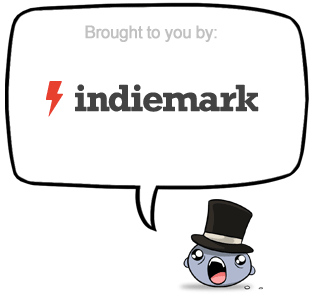 If you care to send me the raw code (scott[at]indiemark.com). I and my coders would be happy to report our findings. In any case, check out http://www.emailonacid.com/ it’s a free tool that you can use to test rendering without the hassle of manual testing or the expense of Pivotal Veracity or similar providers. BTW I love the look, copy, and tone of your website. Good stuff! Thanks, Scott. I will do that. I appreciate the offer, resource and nice words about our site. Your site (and blog) will be a new and valuable resource for me as we fight the good fight for effective, creative and respectful permission-based email marketing. You make a good point about how the email displays, even after the images have loaded. However, in Dave’s defense, I use gmail every day, and have never seen an email display properly. If you have the answer, I would love to know about it. I’m sure Dave would too. 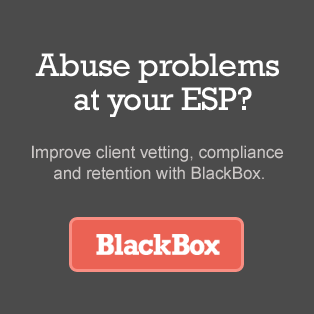 You could probably attract a pretty sizable windfall off a solution that cracks the gmail email display syndrome.